CNG: Printed Auction CNG 75. LESBOS, Mytilene. Circa 454-428/7 BC. EL Hekte (2.52 g, 3h). Sale: CNG 75, Lot: 354. Estimate $500. LESBOS, Mytilene. 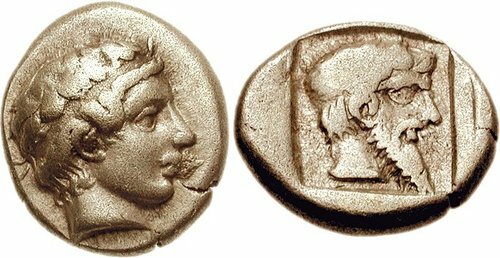 Circa 454-428/7 BC. EL Hekte (2.52 g, 3h). Young male head right, hair in band / Wreathed male head right, wearing long beard, in incuse square. Bodenstedt Em. 52 (dies a/a); SNG Copenhagen 325; Boston MFA 1700 (same dies); SNG von Aulock 7730 (same dies). Good VF, a little die rust.